Round trip distance to Hite Cove ghost town, but the first mile is the best for wildflowers so this can be almost any length. Hite's Cove is famous for its spring wildflowers and it's ghost town. The hike is 8.4 miles round trip, but the best wildflowers are in the first two miles. If you go all the way, you can see the remains of the once bustling town of Hite Cove (also called Hite's Cove). Little remains of the town that once had two hotels and it's own Chinatown. Hite Cove was a mining town once boasting a hotel, two saloons and even a small Chinatown. Now there's just the wreck of suspension bridge, some rusting mining equipment and nature taking back over, which is encouraging in its own way. You park near Savage's Trading post, 22 miles east of Mariposa on Highway 140. Note that since the May 2006 rock slide, access from that direction may be closed for several years and you will have to approach from El Portal. The parking area has portable toilets, but no water unless you want to drink straight from the Merced River. The hike begins with a very short climb through private property and stays on private property for 3/4 of a mile. The trail rolls up and down, never too steep, and is in that respect good for running. However, if you are there in the spring, it will take great self control to maintain any sort of running pace. It typically takes me somewhere between 1-2 hours to cover the first 3/4 of mile. You just have to stop and look at the flowers that grow in both great numbers and great variety. 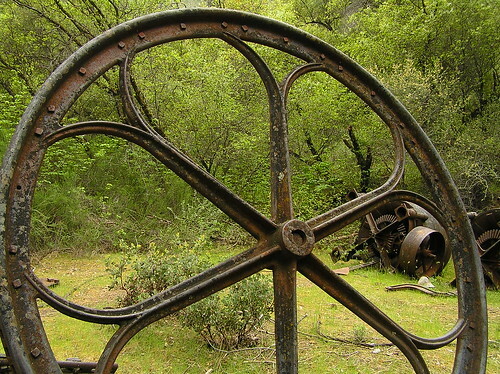 Once the trail descends to some interesting whorled rocks on the edge of the South Fork of the Merced River, you have passed the most amazing wildflower displays, but you'll get to some nice meadows again as you approach Hite Cove proper, where you'll also see some languishing mining equipment. Nice mellow run over rolling terrain, though you'll want to stop every 17 seconds in wildflower season to marvel at the flowers. Other than that, this is an excellent, mellow, low-altitude running trail, mostly fairly smooth with only some very very brief steep spots. Great website! Loyd recommended you! Edie, You've been busy! I just looked at Ambitious Wench Photos and it looks like you've put up a couple hundred fantastic images in just the past week. Good work! Nice trail down to the river, some wildflowers and a nice view, but after that ... there is major downfall from this Spring's storms. You will have to detour, crawl, climb over large trees and bush whack the rest of the trail. Oh, and did I mention you will be going thru an old growth poison oak forest. Poison oak everywhere, even overhead, I'm still scratching. Of course the good for nothing but collecting fees USFS doesn't mention any of this on their current trail conditions page. Actually, that was the situation a couple of weeks ago when Theresa went, but two people we know have been since then and the trail has been all cleared all the way to the old mining town itself. So realistically, it was only in that state of affairs for a few weeks, and with all the stuff we've had going on here with the storms, the power outages and the threatened government shutdown, I'm amazed that it got cleared so soon.